Jason LaRue is done playing baseball. And he shouldn’t have gone out this way. 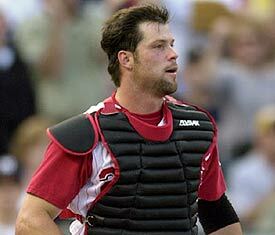 The August 10th basebrawl with the Cincinnati Reds ended his career. We all saw it. We know what happened. It’s the after effects that still has everyone flabbergasted. In other words, the measly suspension Cueto received for his blatant disregard for anyone's safety, including his own teammates. Johnny Cueto ended LaRue’s career. Yes, it is that simple. He should be held accountable for that. He should be held legally responsible for assault. I’m sure a really good lawyer would argue that it was assault with a deadly weapon. Those spikes aren’t bendable after all. Jason LaRue, in his decision to not take legal action, has proven that he’s the bigger man. He protected his teammates and it cost him his career. Now he’s protecting his family from a legal battle that would more likely fall in his favor. More importantly, he’s reminded St. Louis why he’s a fan favorite. Jason LaRue may not have spent his entire career in St. Louis but he’s proven himself time and time again that he is exactly what this organization is all about: CLASS. Best of luck, Jason. You will be missed.